Open-cell spray polyurethane foam, sometimes called half-pound foam, has a typical density of 0.5 lb. per cubic foot and a typical R-value of 3.5 or 3.9 per inch. 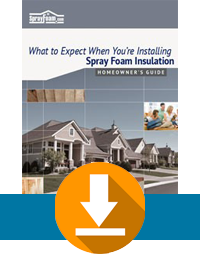 Open-cell spray foam has an average density of 0.5 lbs per cubic foot. It provides a typical R-Value of 3.5 to 3.9 per inch. Since the open cells are relatively vapor-permeable, three inches of open-cell foam have a permeance of 16 perms. In fact, it often requires the use of a vapor retarder when used in interior applications. The factors mentioned above are catalysts when deciding which type of foam to use, as closed-cell and open-cell foams are the most common type of polyurethane foams used in building applications. Choosing the correct type of foam is essential, as one type of foam can be unnecessary and sometimes downright ineffective in certain applications. Case in point: Open-cell foam should not be used in applications where water can be absorbed because water is a poor insulator. Thus, using open-cell foam in below-grade or in flotation applications would provide little or no thermal insulation. In roofing applications or situations where the greatest R-value per inch is needed, closed-cell foam would be the correct choice of foam. Our spray foam experts will help guide to the correct decision for your specific project and application.